Family trips, especially with children, can be difficult with heavy luggage. We recommend a road trip! 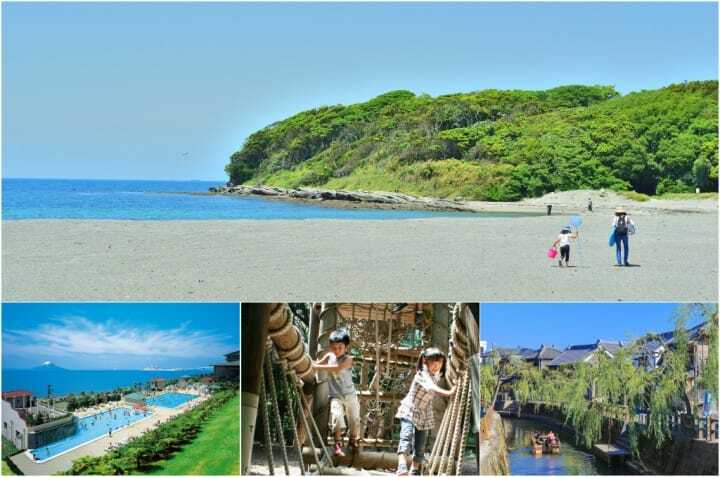 Discover destinations and lodgings in Chiba that are ideal for families. Rent a car from Narita Airport and have an unforgettable journey! Family vacations, especially when traveling with children, can pose challenges, from transporting heavy luggage to choosing kid-friendly spots. The unfamiliar environment also will likely make it difficult to get around via public transportation. To have your family vacation go smoothly in Japan, how about considering going on a road trip? Rather than heading to the crowded Tokyo area, we recommend seeing outskirts of the metropolis in Chiba Prefecture. By renting a car at Narita Airport, you will arrive at your desired destinations in no time! In this article, we’ll introduce family-friendly locations in Chiba that can be visited by rental car. Plan a vacation with hot spring facilities, beaches, and nature that will be fun for the whole family. Sightseeing Spots for a Family Trip! When it comes to theme parks in Japan, Universal Studios Japan® and Tokyo Disneyland are well-known destinations. However, Funabashi Andersen Park in Funabashi, Chiba is another popular amusement facility. In the past, the park was ranked third on a list of Japan’s top theme parks on TripAdvisor. The park has five unique areas. The Fairy Tale Hill Zone, an area that recreates the windmills and farmhouses found in Denmark, and the Kids' Kingdom Zone, which is also fun for adults, are two examples. You can enjoy the flowers and nature, have fun doing various outdoor activities, and also meet goats and sheep. The park is spacious and has more amusement that can fit into one day. Access [North Gate] 15 mintues by bus from Misaki Station (Shin-Keisei Line). After taking the bus bound for SECOMEDIC Hospital, exit at Andersen Park, then walk for 1 minute (*refer to the website for alternate routes). [Park Parking Lot] 500 yen. 300 yen from December 1 - March 15. If you’re visiting Chiba, be sure to enter the hot springs and gaze out onto the ocean! If you’re someone that’s reluctant to go without clothing into a hot spring, head to Ryugujo Spa Hotel Mikazuki instead! The Aqua Park, the indoor pool, and Ocean Spa, the outdoor pool, are heated and require bathing suits. This is an experience enjoyable with the entire family. Ryugujo Spa Hotel Mikazuki has a main wing, new wing, and spa building with guestrooms that satisfy the needs of travelers. We recommend the ocean view rooms, which provide views of Tokyo Bay and Mt. Fuji. Guestrooms with semi-open-air baths are also available to allow you to enjoy some private time. Business Time Varies by the facility. Access A 15 minute bus ride from Kisarazu Station. Day spa pass users can park for free, up to five hours. From the sixth hour, the fee will be 300 yen per hour. *The parking fee will change during the summer, holiday seasons, and the New Year's holiday. Okinoshima is a small, uninhabited island located in Tateyama in southern Chiba. Due to the effects of the 1923 Great Kanto Earthquake, the land near the island rose and connected Honshu (the main, largest island of Japan) to its beaches. The quality of the water here is fantastic and has received the highest results possible in annual water quality surveys numerous times. The water here is comparable even to Okinawa, known for its beaches. The water is clear enough to see down through to the ocean floor, and kids can safely play here due to the gentle currents. Plants grow in abundance on the island, and the sea is full of nature and home to coral. A free parking lot is also located nearby, making it very accessible. Go on an adventure by looking for shells, and playing on the beach together with your children. The time spent in this rare outdoor environment will surely add to your memories. Access [Bus] Take the Nitto Bus from Tateyama Station (JR Uchibo Line) bound for Tateyama Air Base, then walk for 30 minutes from Tateyama-Kokutai Station. [Car] 25 minutes from the Futtsu-Tateyama Road, Tomiura Interchange (parking lots available). Sawara, located in Katori, Chiba, is known as one of three “Little Edos” in the Kanto region with Kawagoe in Saitama Prefecture and Tochigi, Tochigi Prefecture. Its rows of traditional buildings preserve its Edo period ambience. Sawara has also been filmed for the sets of many Japanese television dramas. We recommend strolling through the streets and admiring the historical townscape. There are also cafés and souvenir shops along the way that you can stop in for fun breaks during your walk. There are both free and paid parking lots here. Please check this link (Japanese) for details. Access 15 minute walk from JR Sawara Station. Katori Jingu, a spot near Sawara, is a shrine named as one of the Three Eastern Shrines alongside Kashima Jingu and Ikisu Shrine in Ibaraki Prefecture. There is a practice that has existed since the Edo period in Japan where people visit the Three Eastern Shrines after going to Ise Grand Shrine. Futsunonushi-no-okami, the deity enshrined in Katori Jingu, is known as a protector of the country. In the shrine, you’ll find a lot of nature, including Japanese cedar trees, said to be over 1,000 years old. There are also cedars with their trunks split into three, called "Sanbon Sugi" in Japanese (literally "three Japanese cedar"). Experience the outdoors with your children and the spiritual presence of this shrine! Access Take the Sawara Loop Bus from Sawara Station and exit at Katori Jingu. *If driving, a free parking lot is available at Katori Jingu. Kujukuri Beach, with a total length of 66 kilometers, is the second longest sand beach in Japan. It is on the east coast of the Boso Peninsula, which makes up a majority of Chiba Prefecture. This beach has even been selected as one of Japan’s top 100 beaches. If you’re tired from your drive, admire the ocean, listen to the sound of the waves, and take your time relaxing here! The coastline of Kujukuri Beach continues along straight, doesn't contain many reefs, making it an ideal spot for swimming. Tsurigasaki Beach, on the southern tip of Kujukuri Beach, will be the surfing competition venue for the 2020 Tokyo Olympics and Paralympics. The beach is known for its great waves. Many visitors come to surf, swim, and enjoy the beach in the summer. Parking lots are found on Fudodo Beach, Katakai Beach, and Sakuta Beach all along Kujukuri Beach. Please check the official website (Japanese) for details. Access 25 minutes by taxi from Naruto Station. Or take the Kujukuri Rail Bus from Togane Station bound for Motosuka and exit at Seaside Plaza Kujukuri. To travel to the spots we’ve introduced, rent a car at a car rental counter in Narita Airport. Car rental counters are only located in Terminal 1 and 2. If you will be arriving at Terminal 3, please head to a terminal with a counter. Additionally, it may take time to rent a car if you haven't made an advanced reservation. To smoothly proceed with the process, be sure to make your reservation ahead of time. For details on which car rental companies are at the counters and more, please check Narita Airport’s official website. In addition to bringing necessary documents with you, such as your passport to complete the renting process, be sure to reserve a child seat if you are traveling with a child six years of age or younger. Children six years of age and younger are required to be in a child seat when inside a vehicle per Japanese law. Prices for each company will vary according to size and rental time, so we suggest researching and making preparations beforehand (for reference, prices generally start from 1,080 yen for ten days). Almost all car rental companies will provide a one-way car rental service. Even if you rented your car from an office at Narita Airport, you’ll be able to return the car at a different location as long as it’s the same company. An additional fee may be required depending on the return location, so please check the company’s official website. A Family Trip in Chiba with Fun for Everyone! If any of the locations in this article have piqued your interest, don't hesitate to plan a family vacation to Chiba Prefecture. Chiba is abundant with ocean and nature, making it a great area to drive through. If you’re looking for other destinations easily accessible from Narita Airport, please check out our feature here. Enjoy a family vacation and the wonderful memories to come!